Every day, small and mid-sized local cable operators like Alpine Communicaitons work on behalf of our customers to ensure our communities have access to the TV shows they want – when and how they want it. We are community members that deliver the technology that connects families, businesses, municipalities, hospitals, schools, law enforcement, and the larger economy to cities and towns across America. We negotiate with local broadcasters to carry or “retransmit” their signals in northeast Iowa. Our goal in these negotiations is to keep cable bills low and programs on the air. Local cable operators like us work to reach mutually acceptable agreements with corporate broadcasters that allow access to the network programs TV viewers have come to love and expect to watch – with the goal of reducing the threat of blackouts and unreasonable monthly fees. As your neighbor and local small business, we have a stake in your viewing experience. We also know that you have many choices when it comes to watching TV content, and we strive to keep costs low to keep your business. Our goal is to keep the connections – with our communities and the programs you love. That’s why we fight on your behalf during negotiations with large corporate broadcasters. But these negotiations are only getting harder and the fees are only getting steeper. Why? Because broadcast TV is increasingly going corporate. That means negotiators on their side don’t live and work in our community, even though they benefit greatly from rate hikes. And our customers’ fees are a growing source of income for them as they experience shrinking audiences and declining advertising revenue. SNL Kagan has projected that broadcast TV fees will annually cost U.S. consumers and satellite and cable operators $11.6 billion by 2022, a 51 percent increase from 2016. Unfortunately, smaller cable operators like us, along with our customers, are feeling the brunt of these negotiations. We are being charged higher rates even though it costs corporate broadcasters about the same to deliver their network signals – regardless of the market size. As members of the community, we are also our own customers. 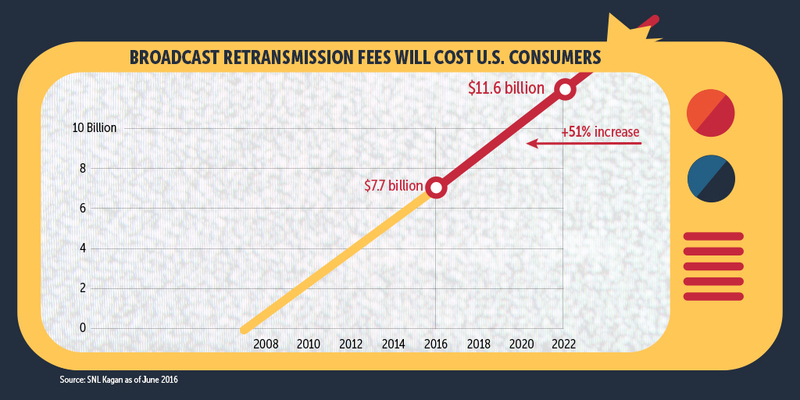 Rising fees and the threat of blackouts affect us just as it does our neighbors, our friends, and our families. And just like our customers, we don’t want to miss broadcasts of our favorite sports event, awards show or the local news because of hardball negotiations. That’s why we’ll continue to negotiate hard with local broadcasters to secure the lowest possible rates and ensure uninterrupted coverage. For more information about how and why local companies like Alpine Communications are subject to these lopsided negotiations every few years, visit KeepTheConnections.com.